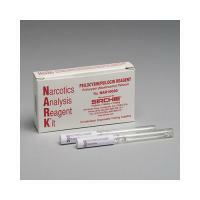 Test substances in the field with confidence with the NARK psilocybin/psilocin mushrooms reagent from Sirchie, a leader in forensics and field investigation. This pack of 10 tubes allows you to presumptively identify psilocybin, the active ingredient found in mushrooms. A distinct pink color during the test signifies a positive reaction. It will also presumptively ID psilocin, a less-common substance, which shows up as a purple color. The test comes to you with step-by-step instructions. Create your own portable narcotics laboratory with this reliable test. This reagent set may only be sold to law enforcement personnel.